Partially debone a chicken or turkey for quick, even cooking and moist meat! Truth: I used to ask the butcher to do all my spatchcocking (and other meat cutting) instead of doing it myself. Let’s be honest – spatchcocking sounds: (1) highly complicated (2) pornographic (3) like something above my pay grade. But really, it’s none of those things. It’s a really simple way to lay out a whole bird for even cooking and better seasoning coverage, which results in more flavorful, juicier birds cooked in a shorter amount of time. Seriously – we’re talking chicken ready in 35-40 minutes at 400F, and it’s time to eat. It’s a win all around. Some people call it “butterflying” – but that’s not the real name. And if we’re pulling out poultry bones, I think we can use the real term, can’t we folks? Once you go spatchcock, you’ll never go back. Using the shears, cut along one side of the backbone, from neck to tail. Repeat along the other side of the backbone to remove it. (You can save the backbone to make stock.) Open the chicken up. Use the knife to cut about halfway down the bone at the center of the breast. Flip the bird over, and press firmly on the breast to flatten. Now you’re ready to season the bird and roast or grill! 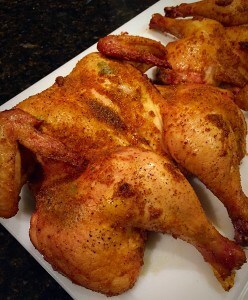 Watch the video to see how to spatchcock a chicken step-by-step! This entry was posted in Articles, Featured, Gluten Free Advice + Experts, KC's Blog, Tips & Tricks and tagged chicken, cooking, dinner, gluten free cooking, how to, kc cornwell, spatchcock, whole foods market, whole foods market gluten free. Bookmark the permalink.